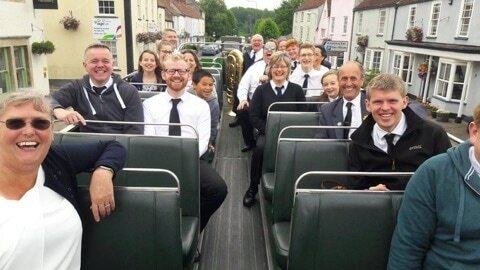 What is it with Lydney Band and Motors!? Saturday 1st July they were seen atop a 1959 Bristol Lodeckka LL6G, for those who want to know what Bus it is, at the very popular Thornbury Carnival parade. ​The theme this year for the carnival was 'Things that fly' so what else could we play apart from 'Those Magnificent Men In Their Flying Machines'!! Almost on a loop throughout the parade with other classic band tunes like The Floral Dance, Teddy Bears Picnic and not forgetting a traditional march The Villager. The idea was conceived at a meeting of the carnival committee where the bus was going to be there anyway and why not put a band on top of it!! Although a very interesting idea and one that has only happened probably a handful of times before, one notable one was in the 1997 film 'Brassed Off' with Grimley Band (Grimethorpe Band), it was a challenge for everyone to see the conductor, no not the bus conductor, the other one! We're not saying it was the same but as we passed the dignitaries by the Pump on The Plain, we were playing The Floral Dance, one that was featured on the film. When we got to the field we were situated by the bar and had a large audience to play to. We played 2 sets of varied music fom Burt Bacharach to Walt Disney. At one point, the Amazing Red Arrows flew over on their way to The Swansea Air Show, what were we playing? Yes, Those Magnificent Men In Their Flying Machines! It was almost as if it were planned. The Audience seemed to like the sound, so did the organisers and they have requested us back again next year. & Mandy Keedwell from Regional Champions, Cheltenham Silver Band, for helping us out. We hope to see you at The Lydney Hospital Fete on 15th July.